If you have worked through the guide with me so far, you’ve realized how important it is to not only have a local listing set up on Google but you also know how crucial it is to have these listings set up properly so that viewers are engaged and they actually want to check out your business. In part 4 of our guide to Google My Business we are going to do discuss, in a little more detail than part 3, how to get the most out of your listing and create ways that will get customers in the door or at least on the phone with you. Today’s example is mainly going to do with the sea food industry because, well, I do enjoy Oysters and all that fun stuff. Specifically, we’re going to be using the city of Austin as I’m currently sitting in Texas and enjoying the warm weather. 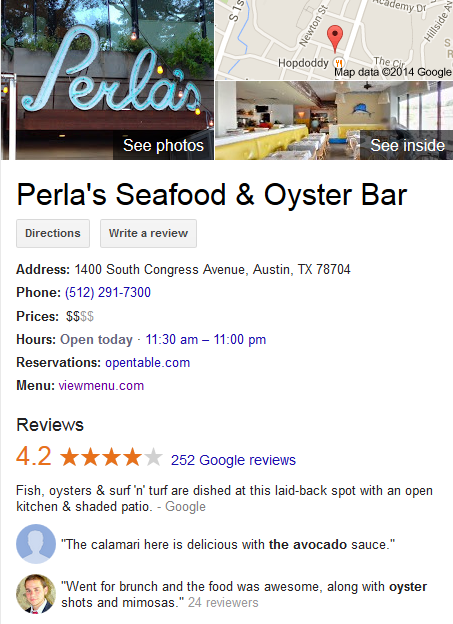 The amount of reviews that Google users have left for your business directly effects how prominently your company shows up in the local results box. In layman terms, without a high number of great reviews your business is likely to be buried deep within the results, and out of the public’s eye. However, with this being said, don’t think that just because you have a ton of reviews will be the holy grail to getting your company listed first. Comments left by people who have used your service or visited you need to be genuine and informative for other viewers to gauge your credibility off of, not just reviews like “A+!” and the other sorts of stuff that is frustrating to see. Quite often I will see my clients ignoring the importance of incorporating their customer’s reviews into their local listing strategy. 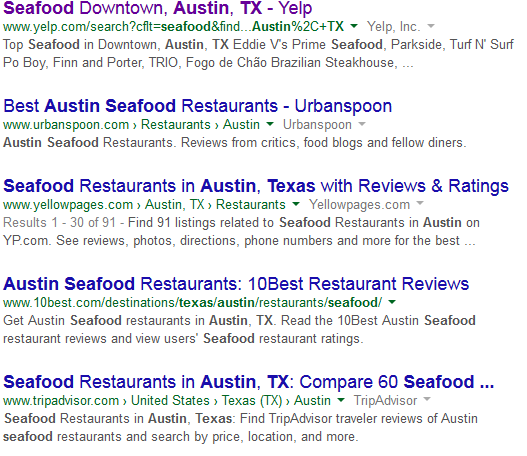 Reviews are, in my opinion, the greatest way to figure out how great a company really is, or isn’t for that matter. 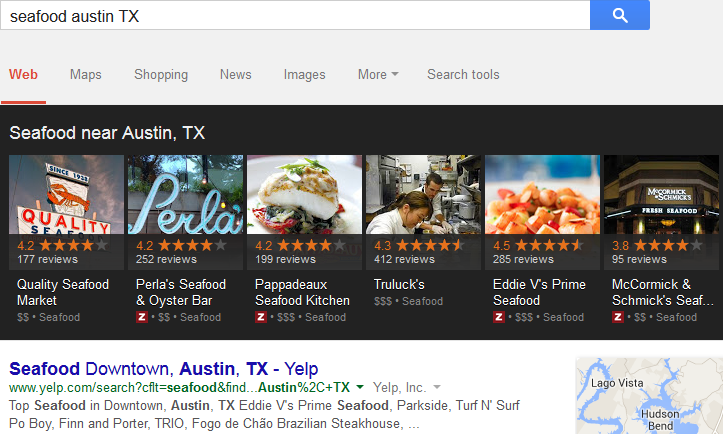 Going back to our seafood restaurant example, what’s one of the first things you check out when researching a new place to eat at? 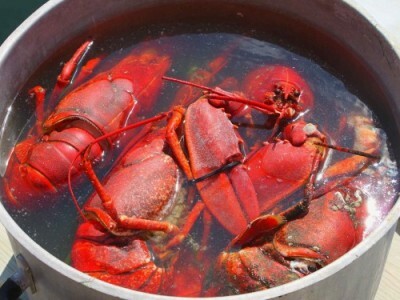 Chances are you will be looking at the reviews to find out how other people enjoyed the food, the drinks and the atmosphere and then use those reviews to determine if you will give the restaurant a chance. How Can We Get These Reviews? 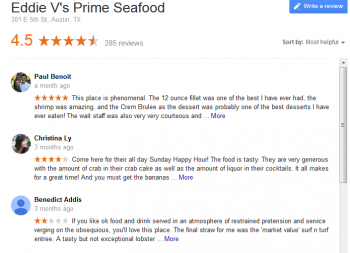 For customers, leaving a review on Google may not always be a simple process. If you think about it, most of your reviews are going to come from point of service, meaning that your clients are often leaving reviews on their cell phones or tablets and not from the comfort of their home. This results in reviews that may be short and abrasive if they are poor in nature, or short and lacking information if they are a good review. To combat this issue you need to implement ways that will get your customers to leave you reviews after they have had time to fully take everything in and they are in a comfortable place to do so. For example, the driving school No Yelling likes to distribute flyers to their students after each lesson that encourages them to leave a review. Not only do they ask kindly for a review but also the flyer lays out the process step by step to make it easy and understandable for the student to do so. Another problem you may be running into is converting the great in person reviews from your customers into reviews that make it online for the world to see. Fortunately, there are many services available that can remedy this problem for you. Get Five Stars is a great tool you can use that allows you not only get your reviews published online more easily, but also see them beforehand. Because you are able to see your customers’ reviews before they get posted to the internet review systems you are able to fix any problems that may have surfaced during your service. By doing this you are able to connect directly with your unsatisfied customer and find out what made their experience unpleasant, giving you a chance to fix it and gain back their trust. Not only does this bring a customer back into good standing but also removes a potentially bad review from your online presence and replaces it with a great review about how you went above and beyond to fix the problem they had with your company. That’s a wrap for part 4 of this 5 chapter series regarding how to use the new Google My Business tool to promote your business online. Now that we’ve covered a majority of the local listing iceberg we will discuss the final tips and tricks that give our local listing the buoyant force it needs to float along. Chapter 5 will guide you through how to generate citations, build off of directories and how to use the popular review sites as a supplement to your Google Local Listing as well as how to optimize these features as well. Thanks for sticking with me so far and I hope to see you for the final chapter!